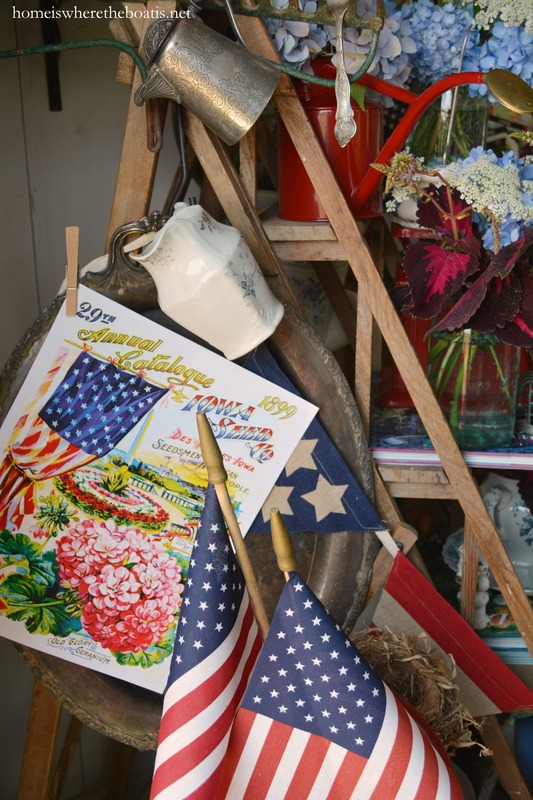 I’m pulling out the Red, White and Blue for a patriotic salute in the Potting Shed for Independence Day! And waving the flag, step-by-step on my ladder. 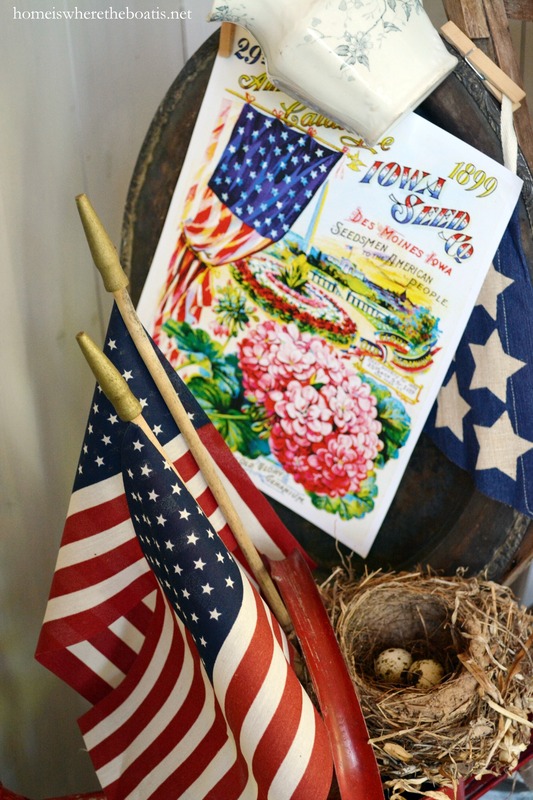 Flags are tucked in bottles and flower frogs, flying in watering cans and pots and a bee skep is buzzing with a little Americana flair. 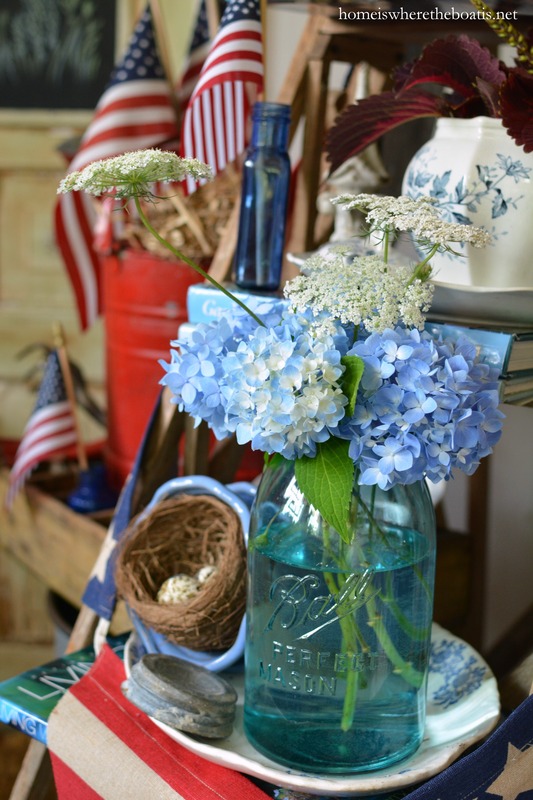 Blue and white Ball jar bouquets of Endless Summer Hydrangeas and Queen Anne’s Lace, join a pair of watering cans and vintage scale in red, like the colors in the US flag: White for purity and innocence, Red for valor and hardiness, and Blue for vigilance, perseverance, and justice. And a stars and stripes banner drapes and swags between the ladder and a seed box. A took a page from my Smithsonian Seed Catalog Calendar with a reproduction of an Iowa Seed Company catalog to wave from my ladder. The cover of the 1889 catalog of the Iowa Seed Company catalog, “Seedsmen to the American People,” features the Washington Monument and White House as a backdrop and “Old Glory Geraniums” on the front for a patriotic salute. And I chalked up my door with a little red, white and blue. However you celebrate, take a few moments to remember and give thanks for our military men and women who protect and serve us. Wishing you a Safe and Happy 4th! 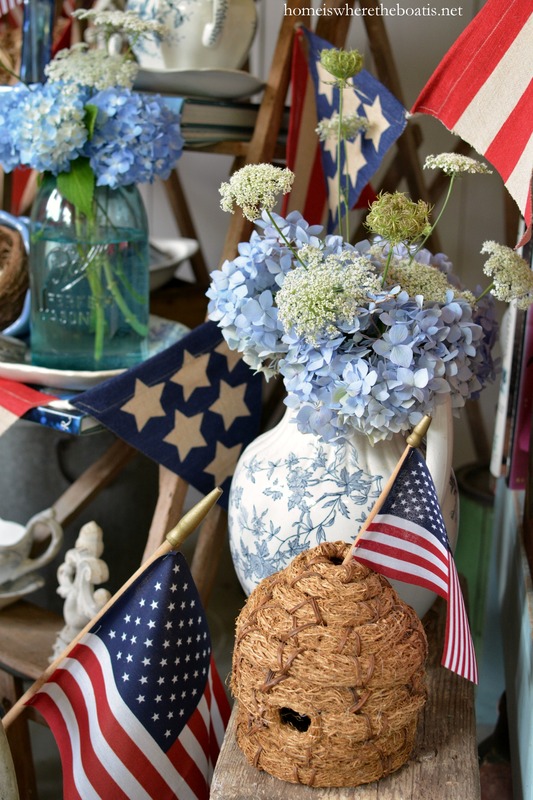 ← A Red, White and Blooming Patriotic Table! 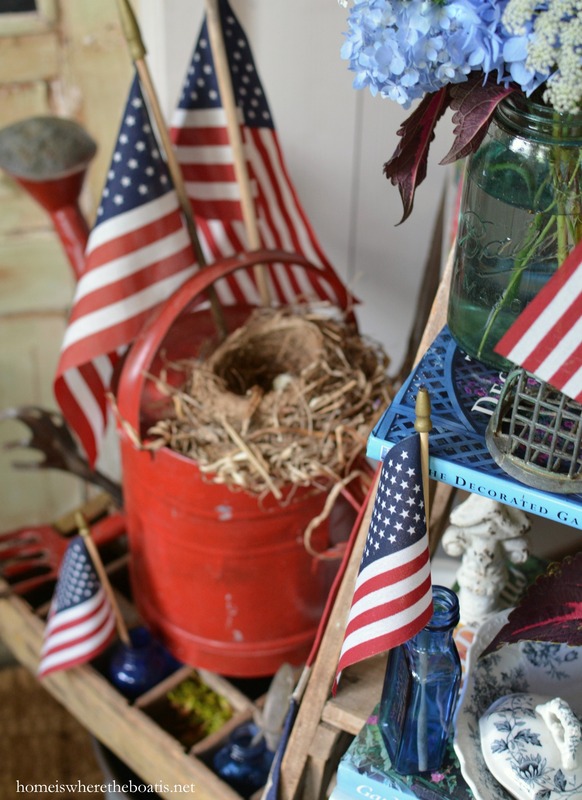 Oh such fun to visit your potting shed decorated in a patriotic style, Mary. It must be like playing in a life-size doll house…it would be for me! Beautiful, just Beautiful. Enjoy your 4th of July. I miss our hydrangeas and hope to have some here by next Summer. thanks so much for sharing the invitation for the Patriotic Party, Mary! 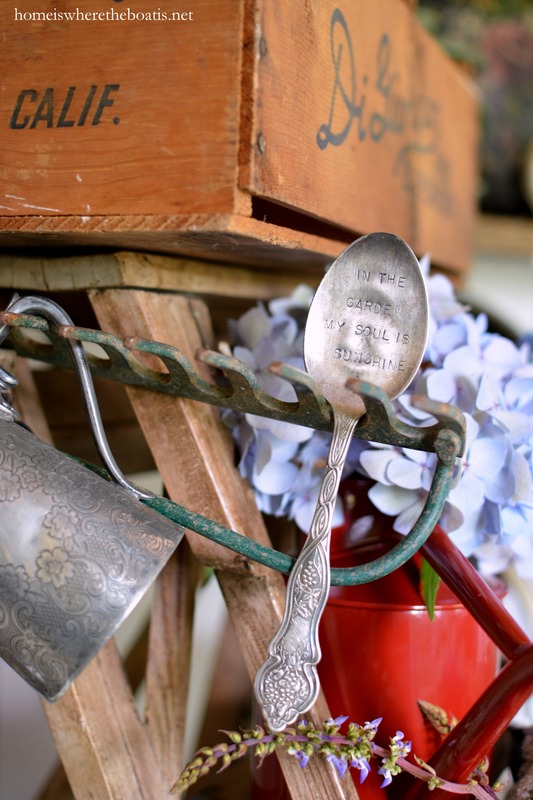 your potting shed is red/white/blue vintage perfection!! Your “she-shed” is beautiful and inspiring in each and every season! Have a wonderful holiday! Oh Mary!!! How you make me wish I had my own potting shed. Perhaps if I moved some of my decorating out there the hubs would have little to say about it! I love all of your details, large and small. Your photo posts always inspire me. Thank you for that and hugs too! What fun! 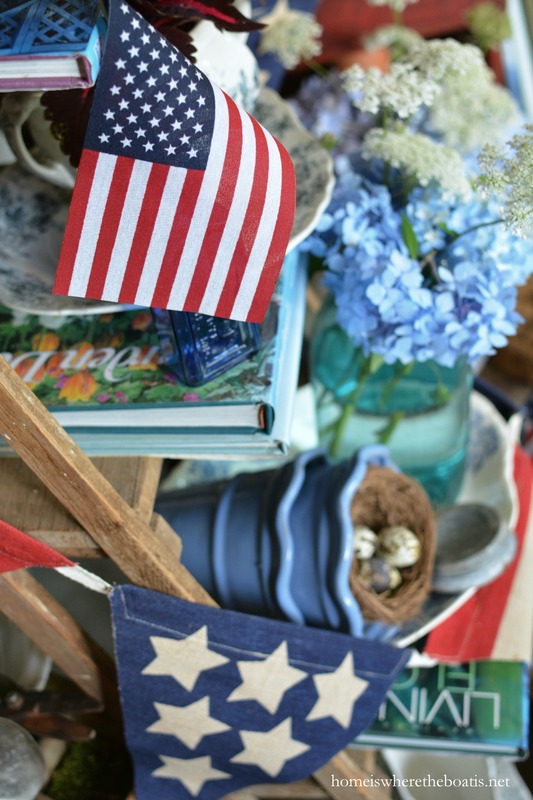 Love your eclectic choice of red, white and blue items. The abundance of small flags make it so festive. I agree “long my she wave”! Happy 4th! I have said this quite a few times. I could live in your potting shed. You do such magnificent things with this space. Just GORGEOUS!!! Happy 4th. so much to love, you are just having so much fun! i love the open door shot too, shows how inviting every square inch of your place is! darling, happy holiday if i miss you! 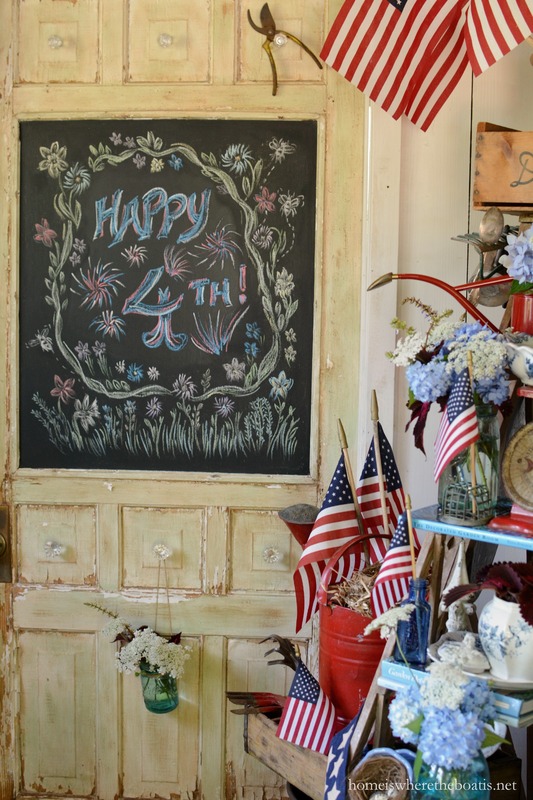 I love your Fourth of July Potting Shed, it is beautiful and so patriotic. I especially love the picture montage at the top of the page, just a little sampling of everything. Happy 4th of July to you and the girls. Hope it a beautiful weekend for boating. Rain here again today. Red, White, & Blue never goes out of style . Long may she wave . Let us remember we are nation under God ! 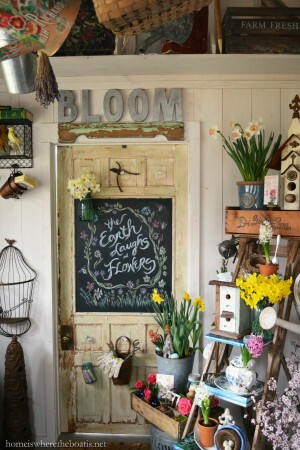 Love your potting shed,and so nice to see Iowa seed catalog (calendar) here. 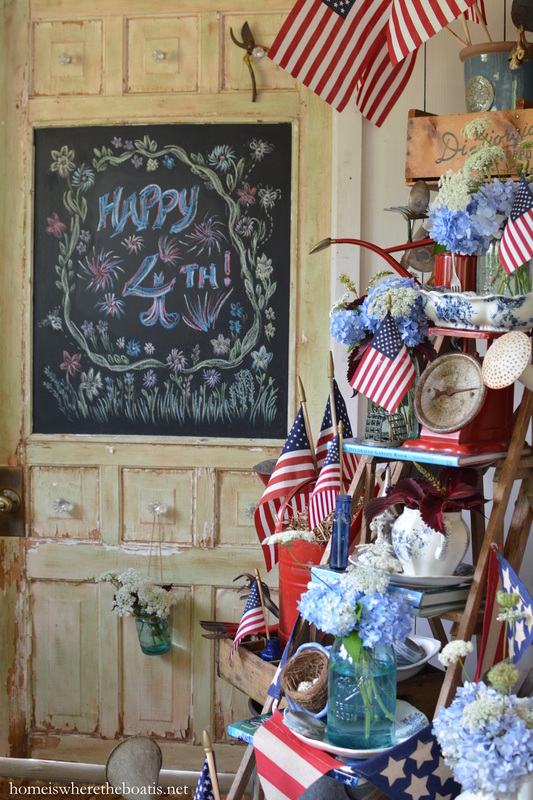 Mary, I so love your potting shed and it looks fabulous all decked out for the 4th! Every detail is perfect. 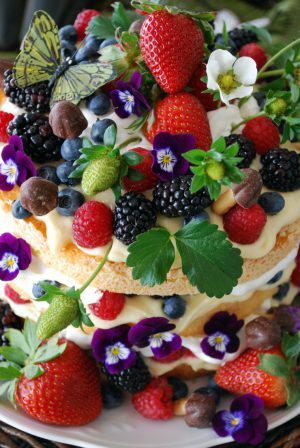 Have a fabulous holiday weekend!!! The potting shed looks like the headquarters for a marvelous 4th of July parade and I can just imagine sitting on the porch and watching the parade of all things red, white and blue go by…with a marching band or two….Beautiful tribute to our country and Old Glory….yes, long may she wave!….and must also say that one of my favorites in the shed is the Iowa Seed Packet….very special as my dad was an Iowa farm boy!! 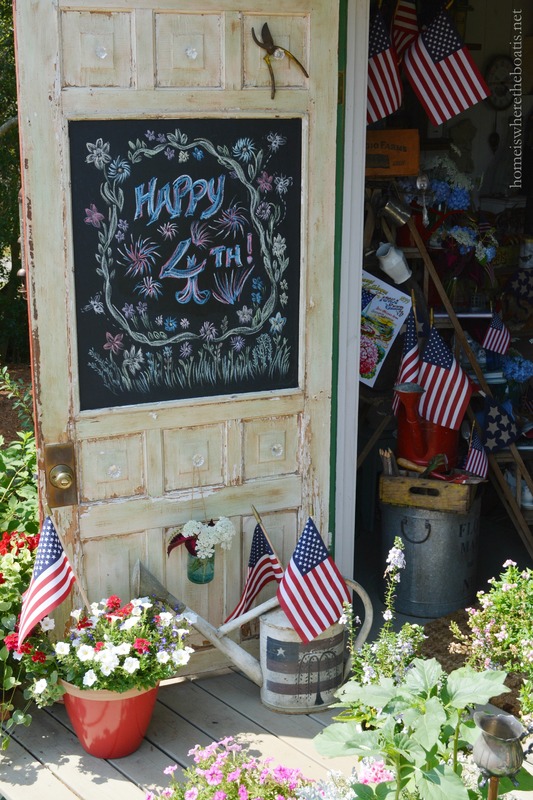 !….Have a great 4th Mary!!! 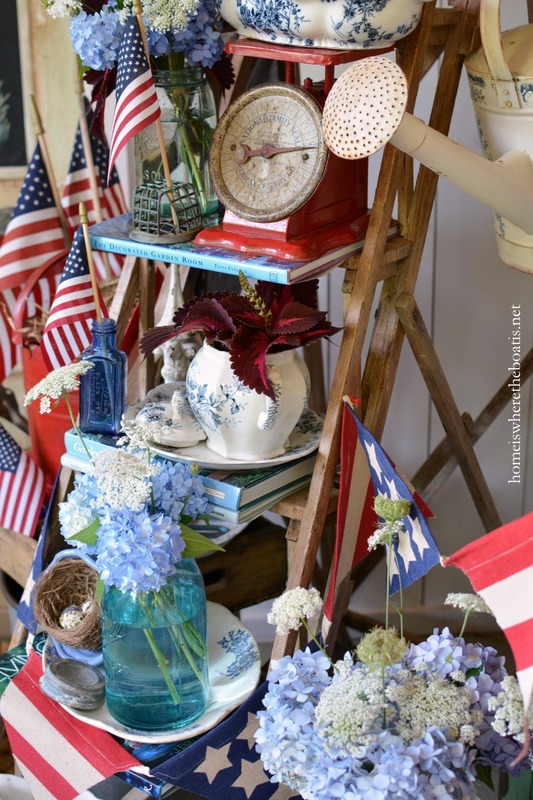 Your patriotic ladder reminds me of a Christmas tree Mary, decorated with treasured mementos~your lovely hydrangeas woven among your beautiful china and fun gardening things, all happily waving the red white and blue! 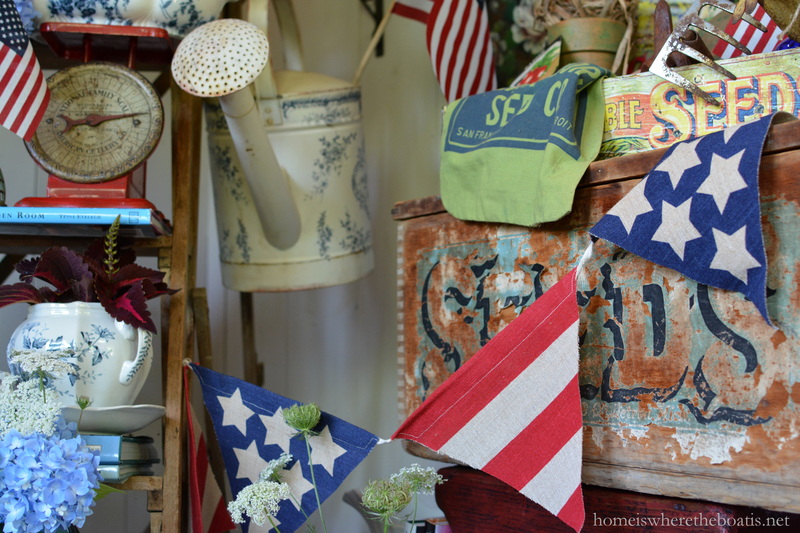 It’s totally fabulous of course, and I just love your stars and stripes banner hanging from the ladder to the seed box, the bee skep and the red watering can! Our freedom is a precious gift, we are lucky indeed to be able to celebrate with pride. Happy 4th Mary, you are certainly ready for a celebration and you have reminded me I need to get decorating! Wow! What a potting shed! You did a great job honoring our country all the beautiful red white and blue! 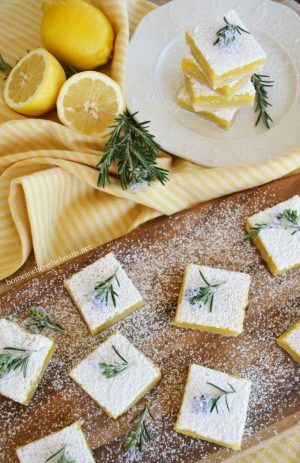 I have recently started a new link up party with a couple of other great bloggers. 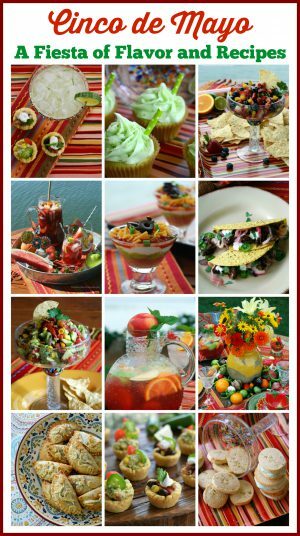 We would love to have you stop by and share your posts! Its gets started every Tuesday night a 7pm CST. We would love to see you there! 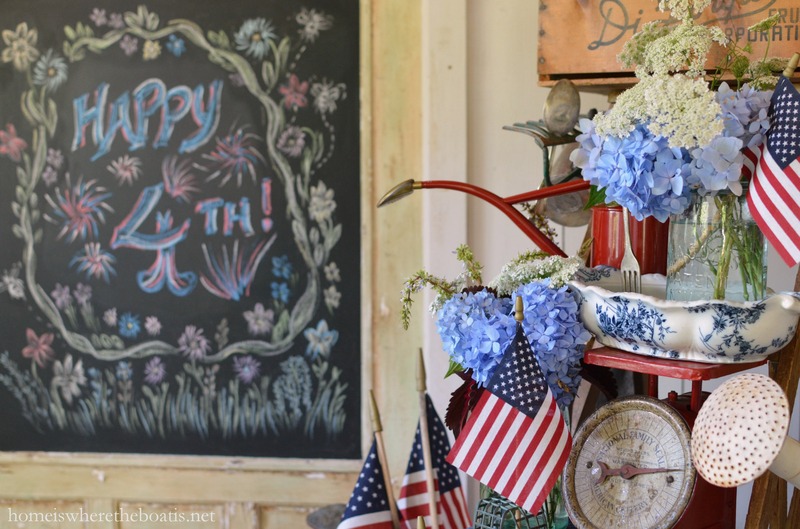 Such a festive and fun post…Wishing you a happy and safe Fourth! You’re killing me! 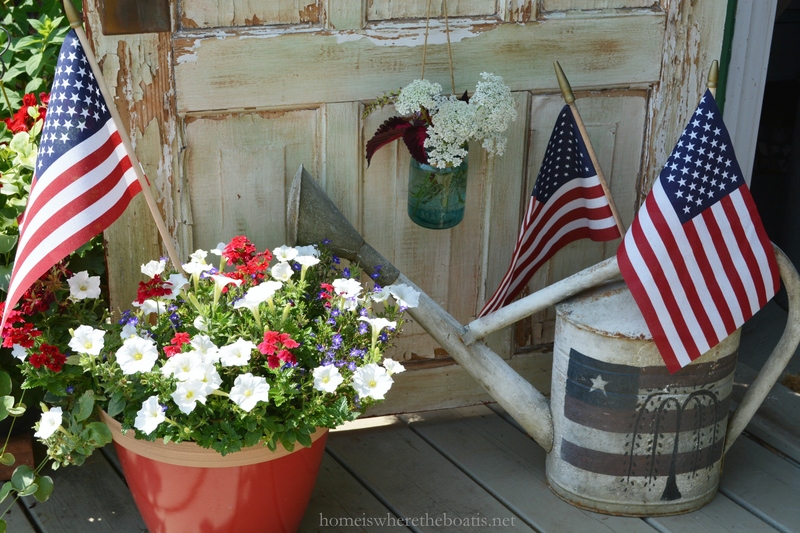 I love your patriotic potting shed! Just adorable! Your shed posts always make me smile. I truly love how you decorate it for every occasion. I know you must have fun playing there! Just beautiful Mary!! Thanks for sharing at Home Sweet Home!